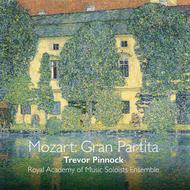 By Royal Academy of Music Soloists Ensemble; Trevor Pinnock. By Joseph Haydn; Wolfgang Amadeus Mozart. Classical. Hybrid super audio listening CD. Published by Linn Records (NX.CKD516). 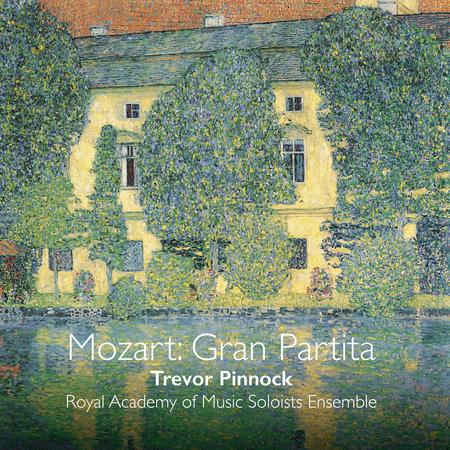 Trevor Pinnock adds to his hugely impressive Mozart discography with his first recording of the composer's great wind masterpiece. For over four decades Pinnock's name has been virtually synonymous with the early-music movement and, with a critically acclaimed Deutsche Grammophon discography of almost all the composer's orchestral works, Mozart. Pinnock brings his wealth of experience to inspire fantastically insightful performances of two favourites by two Classical masters performed here on modern instruments with the very best of the next generation of wind players: the Royal Academy of Music Soloists Ensemble. The 'Gran Partita' is Mozart's largest and arguably his most innovative instrumental work; it demonstrates the sensitivity of the colours of wind instruments in a score of unsurpassed variety. The driving principles are sonority, colour, texture, concertante effects, the juxtaposition of contrasting styles, and the mutability of musical ideas. The nocturnes of Mozart's mentor Haydn magnificently blend the timbres of strings and woodwind with unerring dramatic instinct. The work has all the scintillating argumentativeness and wit that one might expect of mature Haydn, whilst the central Adagio is sublime in its fragility. Trevor Pinnock is recognised worldwide as a harpsichordist and conductor who pioneered performance on historical instruments with his own orchestra, The English Concert. In 2006 Pinnock founded the European Brandenburg Ensemble to celebrate his 60th birthday; their recording of Bach's Brandenburg Concertos was awarded a 2008 Gramophone Award. He works regularly with orchestras such as Leipzig Gewandhausorchester, Kammerakademie Potsdam, Deutsche Kammerphilharmonie Bremen, Mozarteum Orchester Salzburg, Orchestra of the Age of Enlightenment, Royal Concertgebouw Orchestra and Chicago Symphony Orchestra. In 2016 Pinnock released Journey, a unique harpsichord recital that charts two incredible musical journeys four hundred years apart.